The Professional Sound Corporation® Headset Microphone features a three wire positive bias, noise canceling, electret microphone element with a cardioid pickup pattern. Its flat frequency response rivals the best handheld microphones while providing convenient hands free use. Simple is its function, the PSC Headset Microphone sports a comfortable, user-adjustable head band and flexible boom arm. It may be used in applications ranging from live performance vocals and broadcast announcing, to numerous other hands-free operations. The PSC Headset Microphone has a frequency response from 50 Hz to 15Khz and its 1% THD specification is at 146dB SPL. 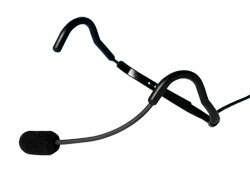 The Professional Sound Corporation® Headset Microphone can be configured to operate with many wireless systems. The PSC Headset Microphone is available in three ways: pre-wired for most wireless systems, as a pigtail version, or with an optional power supply that will allow the PSC Headset Microphone to be plugged into any balanced dynamic microphone input. The optional barrel style power supply contains a lithium battery that will power the PSC Headset Microphone for five years under normal use.